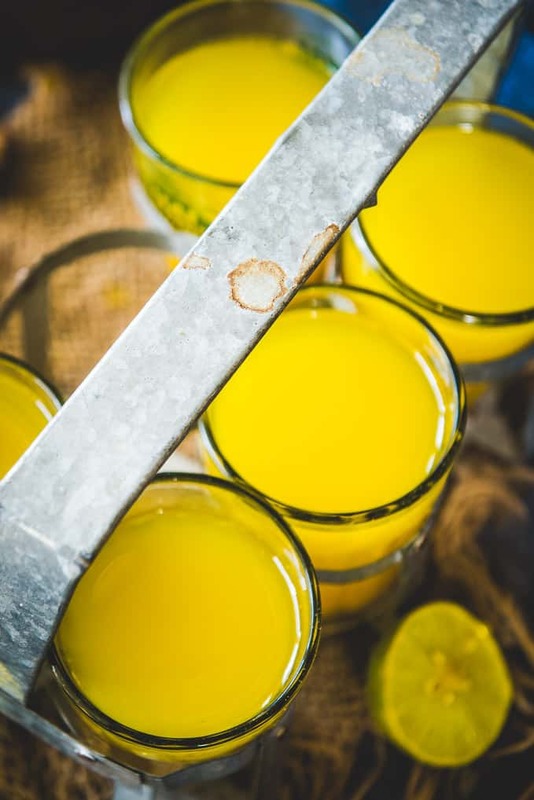 A great health booster to sip in winter and monsoon, Turmeric Ginger Tea is just a 5 ingredient beverage. Furthermore, it gets ready under 15 minutes. And, it perks you up in no time. So, here’s a quick and simple guide to making a soothing cup of Turmeric and Ginger Tea this season! The best part about traditional beverages like Saffron Tea, Indian Masala Tea, Fresh Ginger Root Tea and even Ginger Turmeric Tea is that they are devoid of side effects. Most importantly, turmeric, as well as ginger, have anti-inflammatory properties. As a result, they fuse up to make one of the healthiest ginger tea recipes. This Turmeric Ginger Tea Recipe is that’s why consumed so much even in Japan. And, I don’t really have reasons as to why we shouldn’t be sipping this “elixir” often! This tea is a breathe to make. Also, preparation-wise there is nothing much to it. All you need to do is boil together turmeric and ginger, along with water for starters. Later, honey and lemon after taking it off the heat. Overall, Turmeric Ginger Tea is pleasantly sweet and a tad spicy because of cinnamon. You may also add black pepper if you want. But, for me, ginger and cinnamon work well. Although many people use fresh turmeric root while making it, it is fine to use it even the dry, ground one for this tea. Infact, I have used dry turmeric in this recipe. If you are using fresh turmeric, then use 1 tsp grated fresh turmeric in place of dry turmeric powder. You can serve this tea hot or cold. In summers, I like to add a lot of ice cubes in the tea and serve it chilled. While in winters, I sip it hot. As the benefits of turmeric and ginger are uncountable, so are that of this rejuvenating tea. Let’s have a closer look, still! It is good for the functioning of the heart and it also lowers the cholesterol levels. Ginger boosts the overall activity of the brain and increases focus. The anti-inflammatory properties of ginger and turmeric soothe muscles as well as tissues. Moreover, it also helps with regulating blood sugar, blood pressure and aids the immune system. Lastly, this tea is beneficial for weight loss as well. 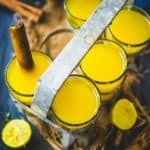 How to make Turmeric Ginger Tea with Coconut Milk? You can make this tea along with coconut milk or any other milk too. Just add 1 cup milk along with water, cinnamon, turmeric and ginger and skip the lemon juice. Bring the mixture to a simmer. Reduce the heat to low and let the tea cook for 10 minutes for the flavours to steep in the coconut milk. Strain and serve. Add water in a pan and bring it to a boil. Add ginger, cinnamon and ground turmeric and simmer for 5 minutes. Switch off the heat and add the lemon juice. Add honey if you wish to. Sieve the tea and serve hot. 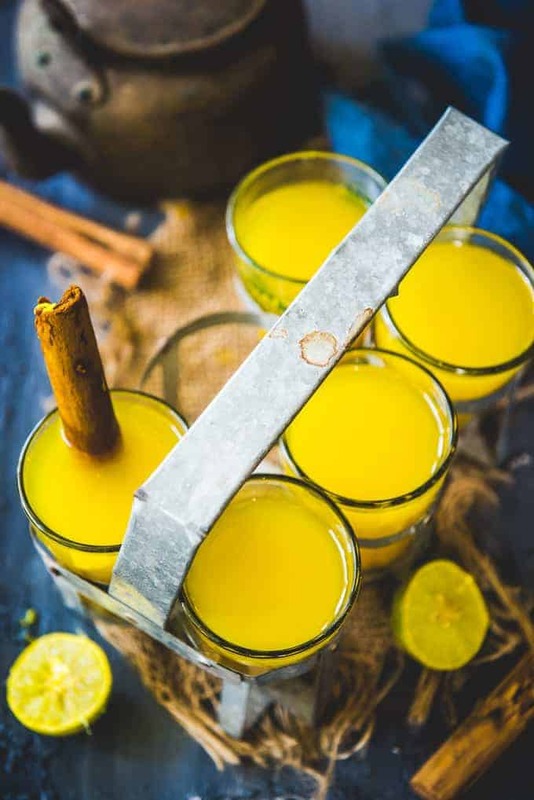 A great health booster to sip in winter and monsoon, Turmeric Ginger Tea is just a five ingredient beverage. Furthermore, it gets ready under 15 minutes. Switch off the heat and add the lemon juice. Add honey if you wish to. I tried this it was really good. Each sip was rejuvenating , but instead of lemon I used honey. Our whole family thought this was wonderful. I had run out of honey the day before so substituted brown sugar. And I used a sprinkle of powdered cinnamon instead of a stick. WIll definitely be making this recipe lots! Thank you. This is very good! I used 1/2tsp Ceylon cinnamon, and after squeezing the lemon juice, since I use organic lemons I placed the lemon half in the water as the whole lemon has benefits also. I added my local honey to the cup after it cooled a bit. I was just wondering, I have Simply Organic ground ginger. Since I am having a hard time at this time locating organic fresh ginger. Would this work as well? Yes sure. You can use it.The taste will be slightly different. I did find organic ginger, and made this today – finally. I used 1/2tsp Ceylon cinnamon, less lemon juice, & pepper. Since I used organic lemons, after squeezing I simmered the lemon peel in the mixture, & used date sugar. It’s excellent!